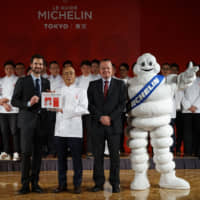 Tokyo has once again been hailed as the culinary capital of the world, holding on to its coveted spot as the city with the most Michelin-starred restaurants on the planet, the French company revealed Tuesday. The capital, which in the 2019 Tokyo Michelin Guide boasts 230 restaurants with the prestigious stars, has held on as the world’s preeminent culinary destination, even when compared to the likes of Paris. While 10 three-star restaurants are located in the French capital, Tokyo has 13. Paris has 16 and 92 two- and one-star restaurants, respectively, to Tokyo’s 52 and 165. Though differences in population make it difficult to compare the two cities, Michelin continues to award Tokyo restaurants more stars than Paris every year. Among new entries in the guide’s Bib Gourmand category, given to eateries that offer “quality food at affordable prices” of about ¥5,000 or less, is Onigiri Asakusa Yadoroku in Taito Ward, making it the first restaurant with a focus on rice balls to be included in the Tokyo Michelin Guide. “Our mission to provide high-quality information that allows people to enjoy mobility and travel has not changed since the Michelin Guide was first published in France in 1900,” said Paul Perriniaux, Michelin’s Japan and Korea Regional Director, during a news conference. “To go further, to have more fun, to experience new things. A total of 484 restaurants have been selected for the 2019 Tokyo Michelin Guide, including 254 establishments that were awarded a Bib Gourmand. 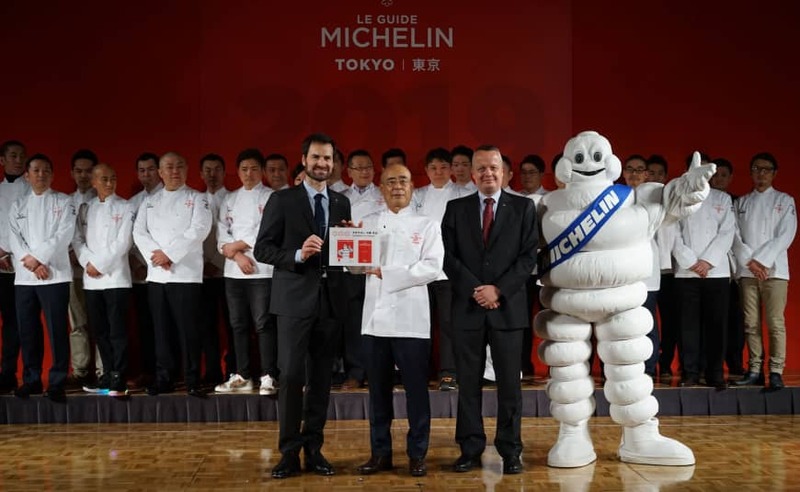 Gwendal Poullennec, Michelin Guide International Director, said that Tokyo has “come to lead the world in gastronomy” since the guide was first published in the city in 2007. The Michelin Guide was first published in 1900 as a directory for French motorists. After expanding into neighboring countries such as Belgium, Germany and Spain, among others, and seeing that the food section was increasingly popular, Michelin hired a team of inspectors to visit and review restaurants. Now, more than a century later, the Michelin Guide has grown into a prolific compendium of the world’s culinary masters. There are few contexts where a single star carries more weight, and to those in the business, it could mean the difference between failure and fortune.